Data Quality Services in SQL Server is a component that is based around the concept of knowledge-driven quality. Here comes a small collection of useful links, tools, components and blogs to watch. I have compiled it for myself in the first place, but ultimately decided to share. This collection in no way pretends to be complete or anything close to it. Feel free to comment with useful links and resources. A great place to start exploring all possible DQS resources. The official Data Quality Services blog from Microsoft. Official documentation on the DQS from Microsoft. Some of the most frequently answered questions that people are keep on asking. Read the problems that people are facing, that might help you avoid some of the issues. You better check it before thinking that you will use it right from the start. Very useful information, beware that you might need to reapply DQS Upgrade some of your Windows .NET components are updated. Also Cummulative Updates for SQL Server might require you to do the upgrade as well. The place to start learning about Knowledge Bases & Domains. A great place to start right from the basics. Good old article which delivers the value on Data Cleansing. Official self-paced Training Kit, where you will find enough chapters dedicated to the MDS & Data Quality Services. Multiple people in the industry keep on referring to this book as the most important one. I am looking forward to get it in time for summer vacations. Tim Mitchell is talking about SSIS & Data Quality Services integration. I have already blogged about SSIS DQS Matching transformation, it was written by Tillmann Eitelberg. If you want to do automated DQS Matching, you simply can’t escape without this download. Unfortunately in SQL Server 2012 (nor in SQL Server 2014), have Microsoft provided a possibility to automatically import Domain values into the Knowledgebase. This is easy to solve with one more great plugin from Tillmann Eitelberg. Some time ago I have found my local VM having 14GB of space occupied by the DQS Projects, so I needed a fast cleanup. 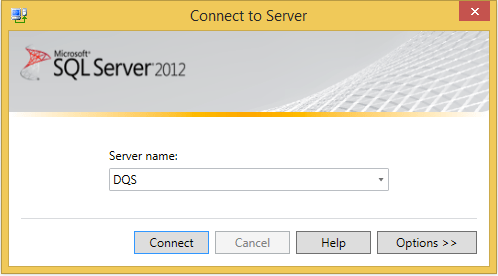 You better consider downloading SQL Server 2012 SP1 Feature Pack, which includes it as well. – Matthew Roche (this blog looks quite abandoned, but keep on watching since Matthew is one of the people who are dedicated on improvement of Data Quality and since he is working for Microsoft). – Dejan Sarka – One of the most well-known SQL Server Specialists. I have attended his EIM seminar at SQLRally Amsterdam and I can highly recommend to anyone wishing to learn DQS. – Tillman Eitelberg – SQL Server MVP, author of some of the most important DQS components and plugins, such as SSIS DQS Matching. Wish he could blog more and maybe there would be more people using DQS. Great insight about DQS. Always useful, especially when come from someone experienced on it.